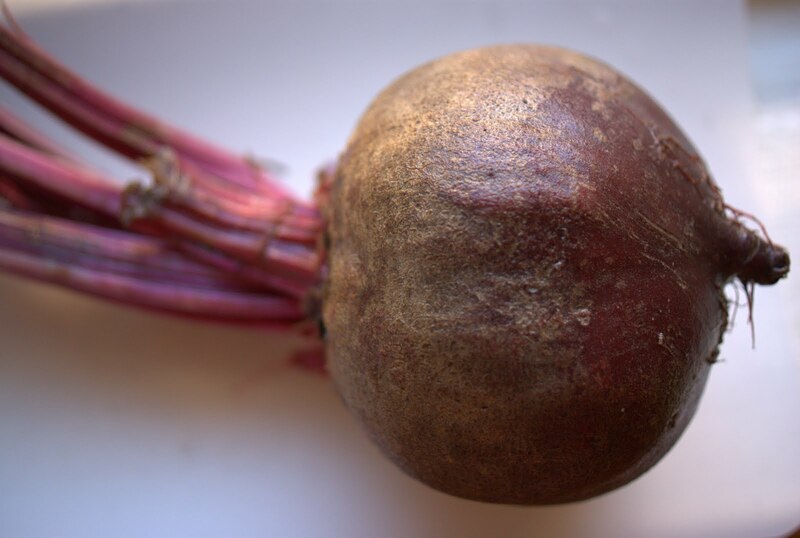 When I was a kid, up to a point we never had beets. I'm pretty sure that my dad had been subjected to canned beets for years, as are many children. But one year, someone, somewhere, not sure who, out of the blue gave my mother a recipe for refrigerator pickled beets. They're easy to make. We had them every Thanksgiving and I would scarf them up until my lips and fingers shone through with a vivid fuchsia. These pickled beets make a believer out of each a beet hater. Each bite is sour, and salty. They have an earthy spice to them due to the simple pickling mix. Most of all, there's something to be said about slicing into a piece of cold, slippery, unctuous piece of solid beet. I should start a club for beet lovers, those converted out of this particular recipe... and we'll be called the beetniks. 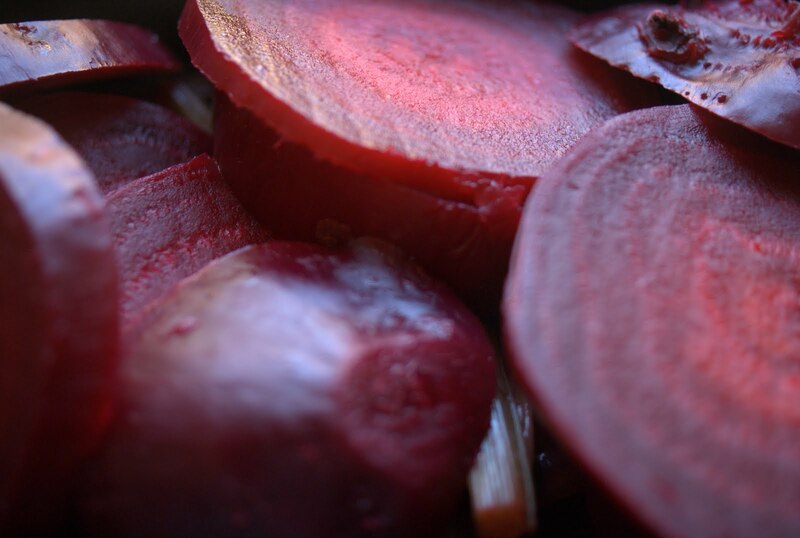 Start out with about three beautifully ripe beets. Don't cut off the stalks as they are also delicious when pickled. 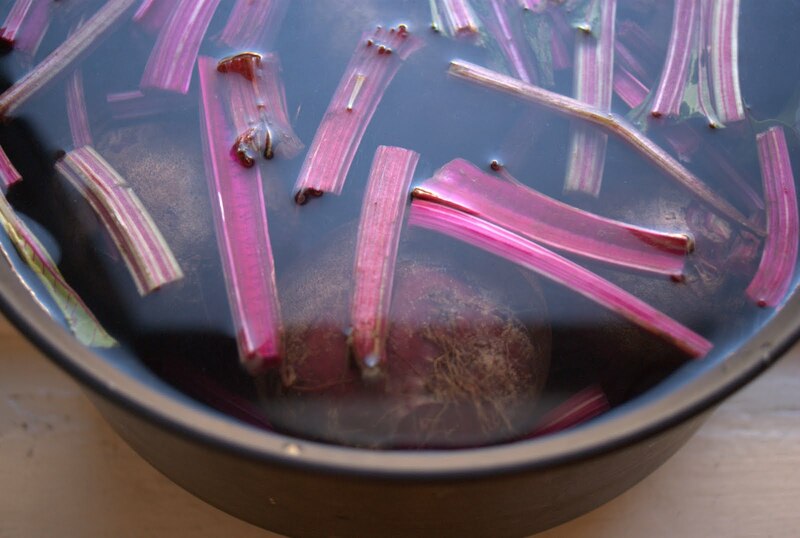 Give your beets a quick rinse, slice off the stalks, and remove the leaves. Now leave your actual beet bulb whole, but I like to cut my stalks into about two to three inch pieces as they're easier to eat. Also, there's no need to peel the bulb, as it'll come off easier after boiled. Place them in a pot, and fill until covered + 1" of water. Add liberal amounts of salt, kind of like you're salting pasta, and boil for about thirty to forty-five minutes. 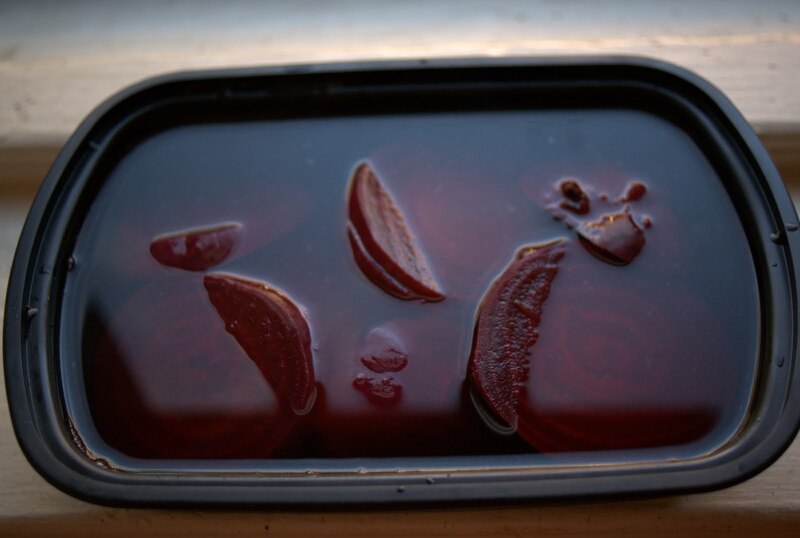 After you've added all of the above to a container, you'll want to use some of the boiled beet water to round out the liquid until it covers the beets and the stalks in the container. Now you're done. You've got two to three days in the fridge until they're properly pickled, and I think they're good for about a week after that. But they never last that long.